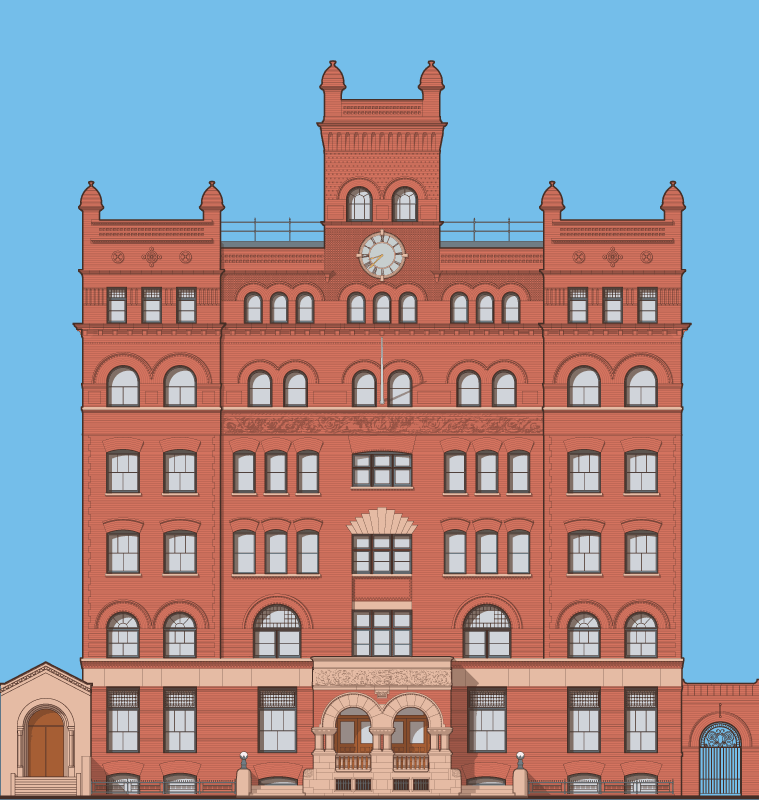 It was an easy decision to choose Pratt Institute’s Main Building for Helpern Architects’ 2014 holiday card. Valentine’s Day 2013, a fast-moving fire and the New York Fire Department’s efforts to contain it destroyed a large portion of Pratt’s oldest  building. No one was hurt, but the aggressive fire also destroyed the portfolios of students and dislodged classes and the school’s administration alike. 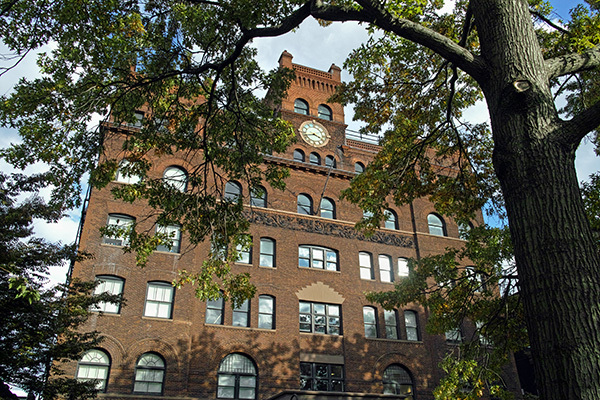 Shortly after, Pratt asked Helpern Architects to return to its Brooklyn Campus to restore and modernize Main Building, in fact, Helpern had repaired the building’s façade in 2002. The original architect was Lamb & Rich. Main was the first building to open at the school. It became a New York City Designated Landmark in 1981 and was listed on the National Register of Historic Buildings with the rest of Pratt Institute’s Historic District in 2005. David Paul Helpern, FAIA, was Principal in Charge of the project. The rest of the Helpern team was comprised of Pratt graduates Jason Cosme and Hyo Lee, with Senior Associate Don Lasker, AIA, as Project Manager. The 6-5/8” by 6-3/4” card, printed on 110-lb “Satin White” stock, features a pale blue sky and a bark-brown base. The Ryerson Walk [west] façade is featured. The color of the brick varies with the time of day and the season; after making field trips and scrutinizing progress and final photography, the holiday-card team lead by Helpern Principal Bennet Dunkley, AIA, decided to make it an optimistic Indian Red. For three decades, Whitehouse & Company has designed these cards, always based on a Helpern Architects drawing. For 33 years, Helpern Architects’ seasonal greetings have chronicled the work of the firm. The first, in 1982, was the restoration and conversion of 122 Fifth Avenue, New York City, from lofts into modern offices. The last few cards have been the Nave of Sterling Memorial Library at Yale , Ft. Washington Collegiate Church , the West 33rd Street Marriott/Fairfield Inn & Suites , and the St. Agnes Branch of the New York Public Library  – in sum, several renovations, an addition, and a new building. Photographs of the restored spaces captured by Brian Rose are here. The view to Main Building from the campus parklet across Ryerson Walk. Photograph © Brian Rose.